Undisputed leader of the raclette cheese market in France, the RichesMonts brand is popular with a wide range of consumers, thanks to its high quality recipe and authentic milk from the mountains. In the 1960’s, the RichesMonts dairy brought the concept of raclette to France. Initially exclusively for restaurants, raclette quickly became a winter sports favourite dish. 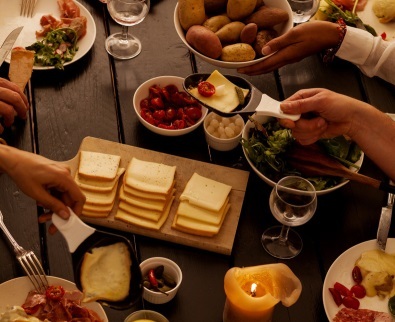 Its popularity spread to families thanks to small, domestic raclette machines, which in turn led to the first “raclette parties”. RichesMonts is the market leader for raclette cheese in France. Milk straight down from the mountain! Our raclettes are made from 100% French mountain milk, collected locally, within 130 km of our cheese factories. According to the applicable regulations, mountain milk is collected in areas that combine altitude (over 600 m) with steep slopes. The brand for French cheese worldwide. It gives its name to a range of great cheeses from France such as Camembert, Brie and Roquefort that are exported to many destinations.